Inspired by new horizons and technical challenge, our expeditions have required innovation, operational dexterity and unique partnerships with our clients. Our solid experience, peppered with notable ‘world firsts’, stands as testament to our drive and determination to see our broad range of clients successful in their endeavors. Whilst we are proud of our previous achievements and fully committed to the extensive list of services we offer, we still thrive on the technical challenges of mounting complex or difficult expeditions in the far corners of the globe. Due to the challenging weather conditions around the Antarctic, flight is not a simple undertaking, but EYOS has an extensive network of Antarctic air operators. EYOS pioneered fly-in, fly-out private aircrafts to the Antarctic. If you prefer to join your vessel once she is in the Antarctic—in order to maximize time or to avoid the infamously rough Drake Passage crossing—we will arrange for you to fly south. EYOS can fly you to the South Pole for the full Antarctic experience. If you would like to have a helicopter aboard your yacht, EYOS will source a suitable helicopter and an experienced polar flight crew. Working with Yacht Carbon Offset, EYOS can counteract your yacht’s greenhouse gas emissions in a clear, auditable way backed by a Lloyds Register Quality Assurance Certification. EYOS assists expedition vessels with all aspects of remote area diving or submersible operations, whether large research diving expeditions or vacation cruises. Our experienced dive guides have first-hand knowledge of the most inaccessible dive sites worldwide, from the sun-bleached tropics to the pristine polar regions. Our Expedition Team includes world-class Expedition Leaders, dive guides, and specialists in anthropology, botany, geology, history, marine biology and ornithology. They are a fundamental part of the EYOS experience. They ensure safe operations while bringing destinations alive for our guests and providing logistical assistance and local knowledge to the yacht’s crew. EYOS Expedition Leaders know the remote regions intimately from both the technical and cultural points of view. They have lived or worked in these areas so they know how to manage wilderness landing operations and to ensure you are safe. EYOS Local Guides offer formal presentations on the region, lead briefings on sites to be visited, conduct question-and-answer sessions, and provide interpretation while onboard and ashore. Their local knowledge of conditions and anchorages are a benefit to Captains. EYOS understands the very private nature of the superyacht industry. Our dive team has the personal skills and discretion to assimilate into an established team and adhere to the specific operating style of any vessel. EYOS often recommends a general naturalist, who can identify everything from tundra plants to whale species. Owners and guests will find the diverse knowledge of our field experts a huge advantage in understanding a region. EYOS Expeditions offers a specialist outfitting service to complement your voyage to virtually any destination. A voyage to the Polar Regions requires both special equipment and clothing in order to ensure all onboard have an enjoyable and safe time. Whether stranding kits, customized parkas and clothing for guests and crew or rifles for polar bear safety, we can supply accessories which will prove invaluable as you explore the frozen wilderness. Our literary service supplies books, maps, recommended reading lists and charts covering the destinations you plan to visit. EYOS Expeditions works with a variety of expedition vessels available for charter worldwide. Our specialized knowledge and operational expertise will help you source the perfect vessel for your expedition, from polar icebreakers and dive support vessels to luxury expedition superyachts and nimble sailing vessels. We know which vessels are available in each location and use our excellent network of charter brokers to find you the right vessel at a competitive rate, avoiding costly repositioning. Navigate to our expedition yacht charters page to see a sample of the fleet we regularly work with. Contact us with your requirements to find out more. EYOS Expeditions is a member of both IAATO and AECO. Our memberships assist in the cruise permitting process and ensure your expedition will be run according to the highest safety and environmental standards. The International Association of Antarctica Tour Operators (IAATO) and the Association of Arctic Expedition Cruise Operators (AECO) associations advocate, promote and practice safe and environmentally responsible private-sector travel to the pristine and ecologically sensitive polar environments. 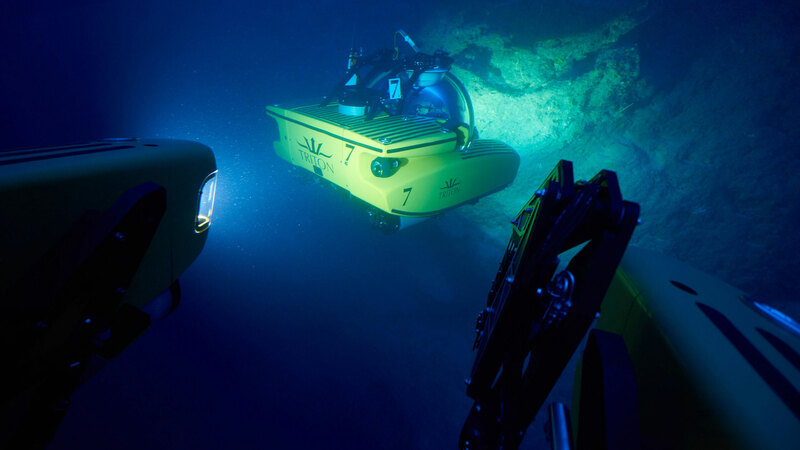 Triton is widely regarded as the world leader in manned subsea exploration with submarines capable of diving over 3,000 feet deep. With our strong partnership, we will work together to ensure all aspects of your submersible charter or purchase are expertly and efficiently handled. We can arrange for these experts to accompany you on your expedition. Our photographers can offer you photography workshops and ‘in the moment’ tips as well as provide you with an exquisite collection of images after your expedition. We also can supply a professional videographer intimately familiar with working in remote locations. They can provide you with a customized, edited DVD of your voyage. EYOS Expeditions is proud to work with Chapman Freeborn on arranging seamless, door to door private jet to private yacht adventures. With their global reach, we can deliver you to the ends of the earth in unmatched luxury and safety. To enhance an already remarkable expedition, we can use helicopters to land guests far inshore for distant hikes, transports clients to Emperor Penguin colonies otherwise blocked by pack ice, or land at the top of a 6,000-foot mountain top at sunrise in the Northwest Passage.